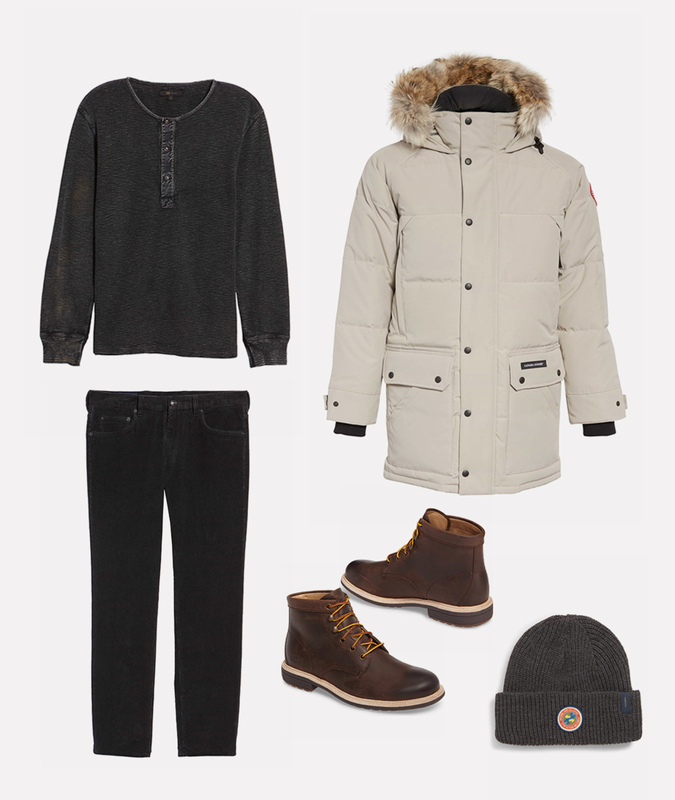 Date nights shouldn’t stop just because the temps drop. There’s plenty to do with your special someone during the winter months, whether that means dressing to the nines and heading downtown, or eating takeout at home on the couch (both equally valid dates, in their own right). Whatever your plans, we can help you pull together the best outfit for your special evening. Let’s start with a formal option. Whether you’ve had tickets for months or managed to snag a last-minute pair, you should pull out all the stops. Enter stage left: a dinner jacket. 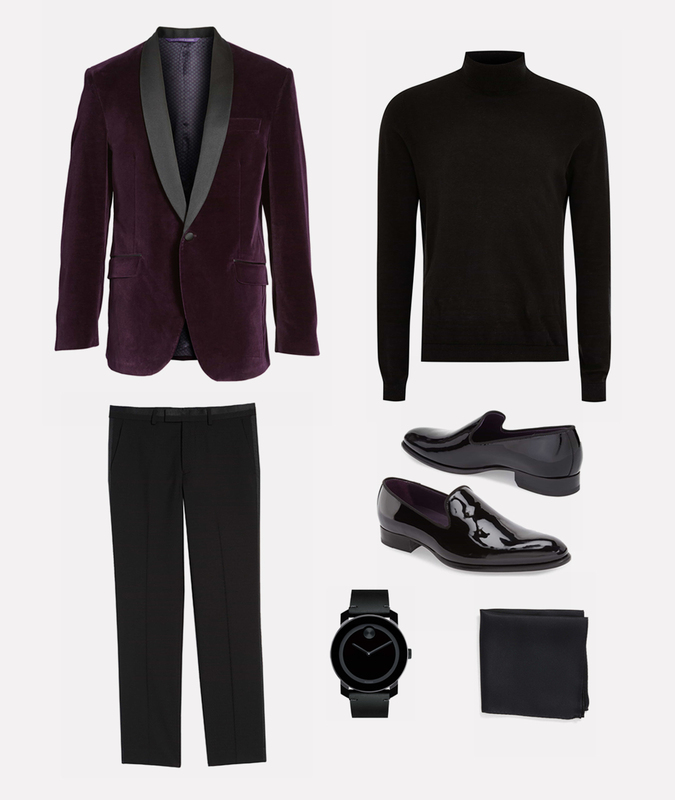 The holiday season is the perfect excuse to try a velvet number in a color other than black. And underneath, a lightweight turtleneck sweater is a twist on classic formalwear without being too in-your-face. STYLE TIP: Your coat is the introduction to your outfit, so make it count. A long topcoat is classic, but in a print it’s cool and unexpected. Impressions are important, no matter if this is the first meeting or the hundredth. When spending time with your S.O.’s family, aim for a “Wow!” versus a “... Whoa.” It just takes one great piece to pull it off, like a pair of wine-colored chinos. 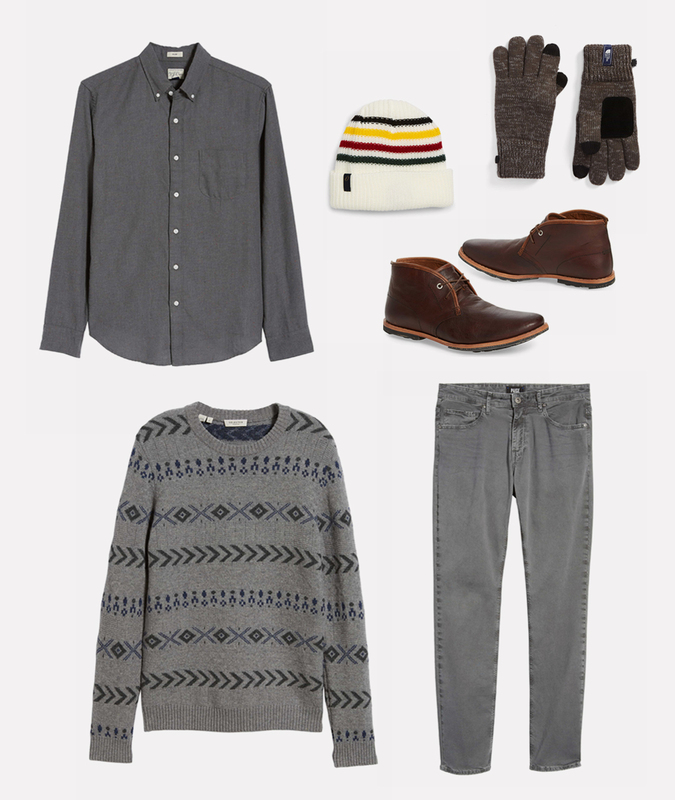 Then, build the rest of your look around classic winter pieces. A simple patterned sweater over an oxford shirt in the same hue is a modern twist on a timeless combo. To accessorize, try a sleek leather watch—it’ll remind the ‘rents how responsibly punctual you are. An evening outside can be romantic, but only lasts as long as your toes do. 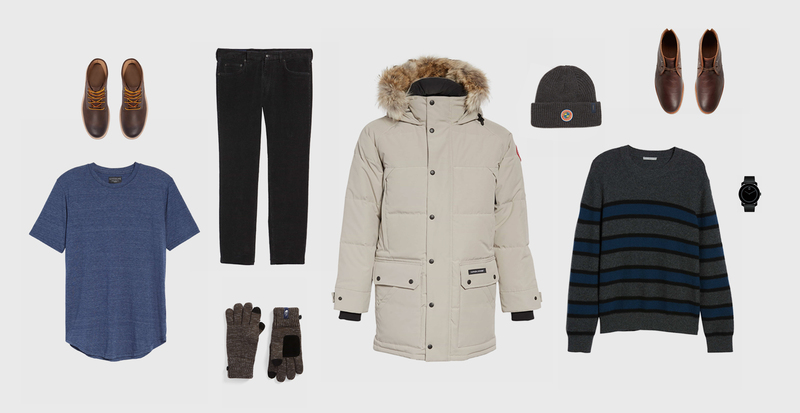 So if an ice skating rink, tree-lighting ceremony, or outdoor holiday market is on your agenda, layer up. A warm pair of boots and a down jacket with all the bells and whistles are worthy investments, and cold-weather accessories are, too. Don’t forget the touchscreen gloves—you know there are going to be photo ops. STYLE TIP: Not only do we love activewear for its comfort, but performance tees also help regulate your body temperature, making them great for layering. Sometimes, a couch date is all you need (or can manage) to get in some much-needed quality time. And for that, we recommend going ultra comfortable. Think of textures like fleece, cashmere, and shearling that keep you warm, but were made for cuddling. 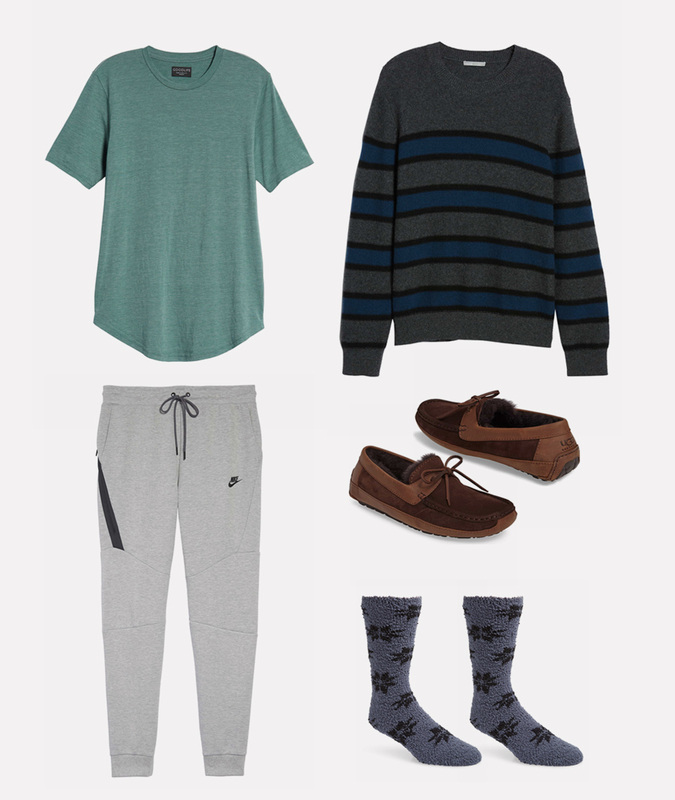 Athleisure pieces, like these tapered joggers, are great way to upgrade your sweats. And if you’re overdue for some new underclothes, we’ve got you covered.